Brew the coffee with the 6 cups of water in a standard drip coffeemaker. (Alternatively, do it in batches in a French press.) While the coffee is brewing, cook the pumpkin and spices. Place the pumpkin, cinnamon, ginger, nutmeg, and cloves in a small saucepan and cook over medium heat, stirring constantly, until heated through and very fragrant, 3 to 5 minutes. Add the sugar and cook, stirring constantly, until the sugar is dissolved and the mixture is simmering at the edges of the pan. Scrape the mixture into a 3-quart or larger slow cooker. Add the brewed coffee, half-and-half, and vanilla and stir to combine. Cover and cook on the HIGH setting until the mixture is hot and the flavors meld, about 2 hours total, stirring halfway through. When ready, whisk to recombine and switch to the WARM setting; it can be kept warm for up to 2 more hours. (If the bits of spices floating on top bother you, strain the mixture through a fine-mesh strainer or cheesecloth and return it to the slow cooker.) Serve in individual mugs topped with whipped cream and nutmeg, if using. Make ahead: Brew the coffee and cook the pumpkin mixture the night before, then cool and refrigerate. Proceed with slow-cooking the next morning. In Recipes-list.com we have selected the most viewed recipes from category - uncategorized . Enjoy the best recipes specially selected for you! 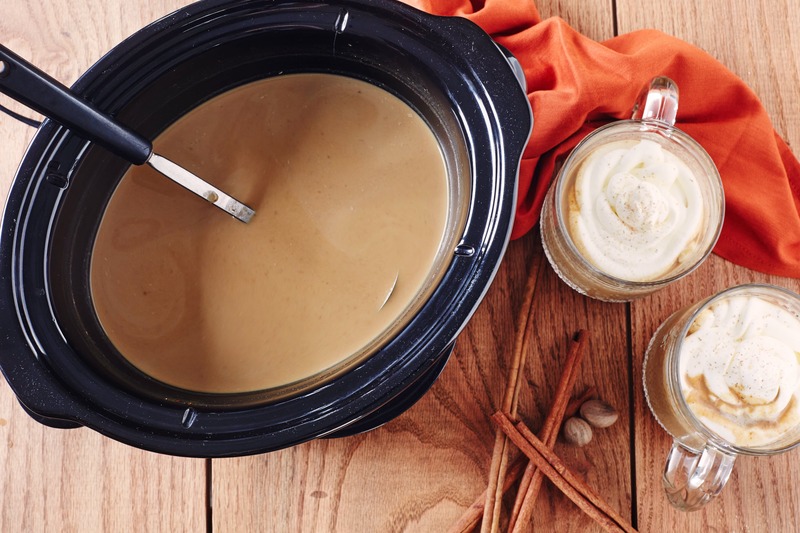 Slow-Cooker Pumpkin Spice Lattes is the right choice that will satisfy all your claims.